The Burning Bridge John Flanagan Sci Fi. Book is in good condition, all pages intact. The evil Morgarath has sent his minions to enslave the villagers of Celtica. Will and Horace follow the Ranger Gilan on a mission to save the Celts and divine Morgarath's true purpose, before it is too late for the entire Kingdom of Araluen. 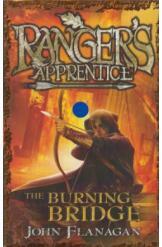 Book 2 of the Ranger's Apprentice series.